The first annual Team Vogel vs. Cancer event was a huge success, raising over $35,000 for six local families as well as the Gundersen Lutheran Foundation and the Franciscan Skemp Cancer Center. Over 1,000 brats and hots dog were sold, 700 pulled pork dinners were enjoyed and many people went home with fabulous sports memorabilia, baskets and great prizes from the silent auction and penny raffle. Please read below for an overview of the 2010 event, held June 26th at the JC Pavilion in Winona, MN. CONGRATULATIONS to our Men's Softball champions, TEAM VOGEL (aka Audio Designs). They beat Reed's Tree Service twice to take home the championship. Also, a big thanks to the teams for donating their prize money back to Team Vogel! Lee Rain took home the Home Run Derby Trophy. 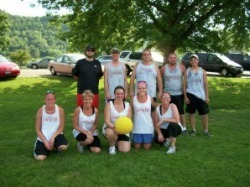 Congratulations to the undefeated Cancer Kickers for taking home the kickball championship! Kick'n For Cancer took home the consolation trophy! Thank you to everyone who participated in the first annual 5k and 1 Mile events. With your help, we hope to make this an annual event that all runners in the Winona area participate in. CONGRATULATIONS to Adam Nyseth, overall winner of the 5k with a time of 19:19. CONGRATULATIONS to Jon Urbick, overall winner of the 1 Mile Run.